The mourning dove is the most popular game species in the Southeast, and South Carolina is blessed with an abundance of these speedy birds. The best way to attract large numbers of doves during the hunting season is to provide an abundance of good dove foods in an environment conducive to feeding by doves. Individuals interested in dove field planting recommendations should contact the S.C. Department of Natural Resources (DNR) Small Game Project in Columbia at (803) 734-3609 or their local regional wildlife biologist. A planting guide for dove hunters is available, as is the South Carolina Migratory Game Bird Hunting Guidebook which contains information on field preparation and frequently asked questions. “Several factors, including size, location and crop selection, should be considered when planning a dove field,” said Billy Dukes, DNR Assistant Chief of Wildlife. Generally, a dove field should consist of about one acre per hunter. Fields should not be located near busy highways, residential areas, schools, or hospitals. Also, doves are easier to attract if fields are located within an agricultural landscape, rather than within a large block of woodlands. Pending approval by the S.C. Natural Resources Board and the U.S. Fish and Wildlife Service, the 2013-2014 mourning dove season in South Carolina will be Sept. 2-7 (afternoons only), Sept. 8-Oct. 5, Nov.23-30, and Dec. 19-Jan. 15. The daily bag limit for mourning doves is 15 birds. 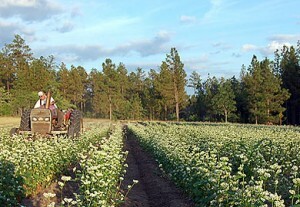 A single field can be planted to attract good numbers of doves throughout the season by alternating strips of several different crops, according to Dukes. Browntop millet, which matures in 60-70 days, will provide abundant food during the early dove season. Proso millet will mature in 80-90 days and should be available as the browntop starts to disappear. Grain sorghum and sesame will provide seed even later into the season. Also, planting crops on staggered planting dates will allow the crops to mature at different time periods throughout the season, providing a continuous food source over a longer time period. Planted strips should be 30 to 50 feet wide, and should be kept as weed-free as possible. Doves have weak feet, and will not use a field where they have to scratch and search for food. Planting crops in rows will allow cultivation of crops, providing bare ground and making finding downed birds easier. Dove fields should be planted on dates that allow the seed to mature about two weeks prior to hunting. This gives doves time to locate the food source and become accustomed to feeding in the field. Options to planting a dove field include leasing shooting rights or buying standing crops from farmers. Harvested grain fields can provide outstanding dove hunting opportunity, if fields are managed properly or some grain is left standing in the fields. Disking strips through a harvested grain field is beneficial in providing the “clean-ground” feeding environment preferred by doves. To maintain a productive dove field, hunters should not hunt a particular field more than once or twice a week, and birds should be allowed to feed unmolested for a least a portion of the late afternoon hours. Likewise, fields should be hunted during either morning hours or afternoon hours, but not both. “Overshooting will drive doves away from even a good quality dove field,” Dukes said. Hunters are reminded that legal shooting hours during the first three days of the season are from noon until sunset.